Their land is predominantly in North West Florida, but they have farm land in Georgia and Alabama as well. “We have really good soil but our ability to irrigate is limited. We have mostly dry land crops – only about 20% is irrigated with pivots,” he said. The average rainfall in their area is around 54″ per year. This area benefits from a long growing season and coastal showers. Their family plants around 4500 acres of cotton per year averaging around 900 lbs per acre, rotated with 2200 acres of peanuts. Sonny is the chairman of the Jackson County Soil and Water Conservation Committee and a steward of the local resources. About 25% of his farmland is “no-till” but most is strip-tilled. “We started ‘no-tilling’ back in the late 70’s before it was even popular. We are always trying to conserve the water and the soil and make things better. We always try to do what’s best for the yield and for the environment.” Sonny’s long-term focus is more than just sustainable agriculture – he is trying to actually improve the land and the local resources for the future generations. Sonny and his brothers all have separate operations, but they all work together, mainly sharing harvest equipment. 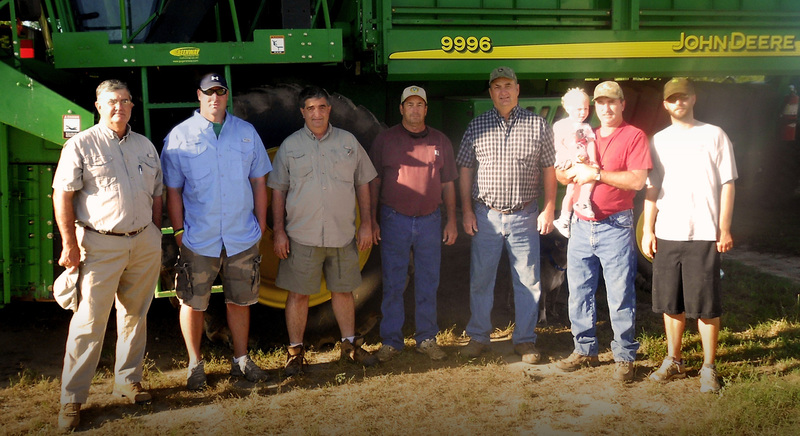 His son, Josh, began farming with him in 2006 and assists in managing Sonny’s operation. Sonny’s wife, Teresa, assists in administrative duties by handling the bookkeeping part of the business. Sonny remarked, “It takes everybody to get it done.” Sonny also has ownership in a ginning business, which includes two gins, one in Florida and the other in Georgia. There are 65 owners of the operation and he acts as president.